For more information about this Proven Safety Countermeasure, review the Pedestrian Safety Guide and Countermeasure Selection System. 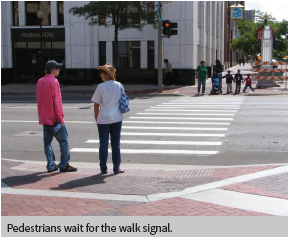 Enhanced safety for pedestrians who may be slower to start into the intersection. 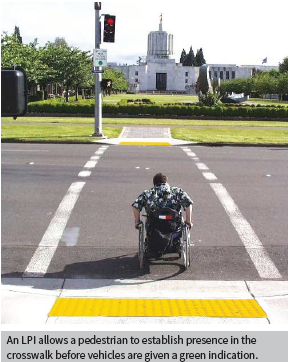 FHWA's Handbook for Designing Roadways for the Aging Population recommends the use of the LPI at intersections with high turningvehicle volumes. 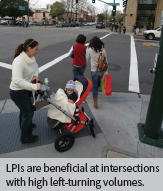 Transportation agencies should refer to the Manual on Uniform Traffic Control Devices for guidance on LPI timing. Costs for implementing LPIs are very low, since only signal timing alteration is required. This makes it an easy and inexpensive countermeasure that can be incorporated into pedestrian safety action plans or policies and can become routine agency practice.